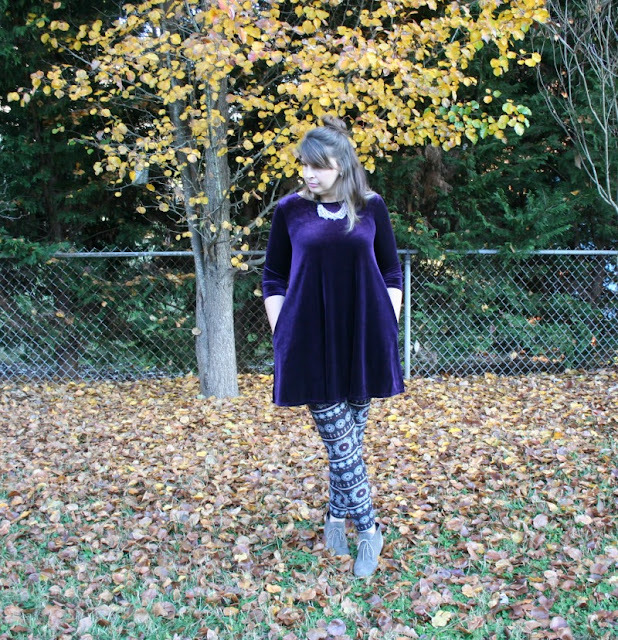 I recently worked with an Agnes and Dora rep on a collaboration and one of the items I selected was a purple velvet tunic. When I put it on, I was taken back to a simpler time when I worked at the Mall and listened to Stone Temple Pilots and Brittany Spears. If you have no idea what I am talking about then you are too young to have been around when velvet was "in" during the early 90's! It is times like this that I wish I would have kept my velvet pieces. 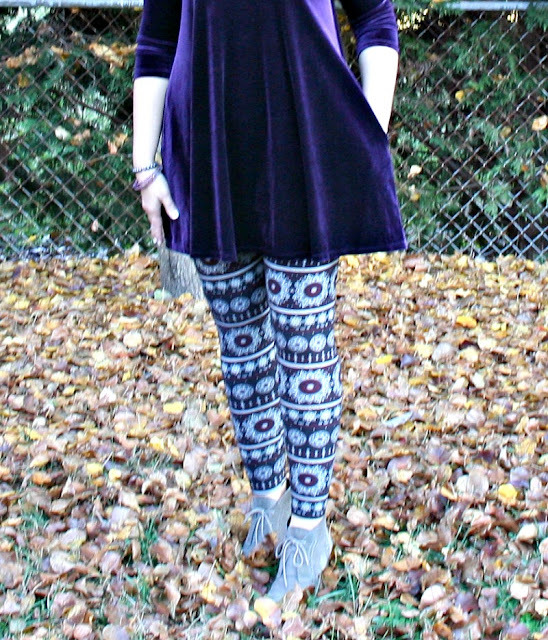 This velvet tunic is so versatile; it can be worn with a skirt or leggings for a perfect holiday look...and it even has pockets! 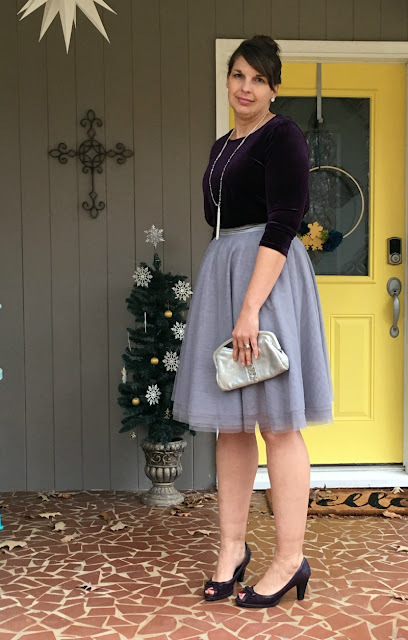 For a holiday party look I tucked the tunic into a grey tulle skirt and paired it with purple peep toe pumps and some sparkly jewelry. For a casual gathering, I wore it with patterned leggings and grey suede wedges. In the bright light, you can see how pretty and saturated the purple color is, which makes it perfect for the holidays! Which look is your favorite? Do you have any velvet pieces in your closet? Disclosure: The tunic in the post was provided to me by Agnes & Dora, but all thoughts are 100% my own. I just love BOTH of these looks, Mary! 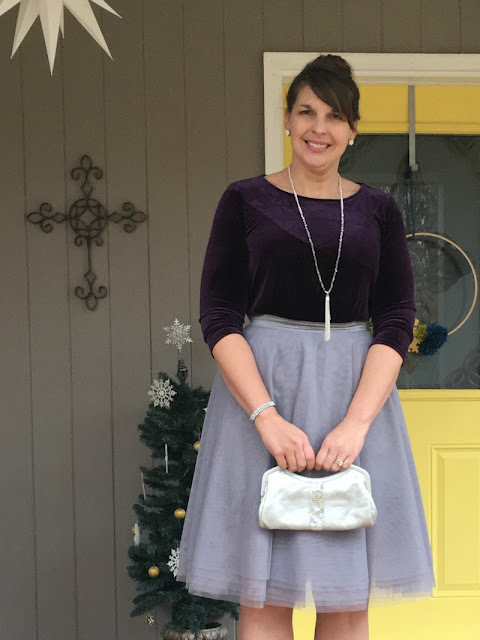 I have a midi length black tulle skirt, I should try layering my mustard colored velvet tunic under it. I wish I had some fun leggings like that, yours look great with the velvet tunic! Thank you! I cannot wait to see your look with the tulle skirt!